For other uses, see Huarache. Huarache (sometimes spelled guarache) wa'ɾatʃe is a popular Mexican dish consisting of an oblong, fried masa base, with a variety of toppings including green or red salsa, onions, potato, cilantro and any manner of protein such as ground beef or tongue, and then finished with queso fresco. This dish is most popular in its hometown, Mexico City. 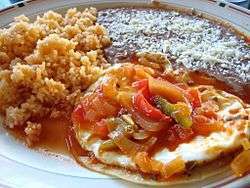 The dish is also sold in cities with Mexican-American populations such as Los Angeles, Chicago, New York, San Francisco, San Antonio, or Houston, but have yet to become widely available across the entire United States. The name "Huarache" is derived from the shape of the masa, similar to the popular sandals of the same name. The word Huarache is originally from Purépecha  and the Nahuatl word for huarache is kwarachi. Huaraches are similar to sopes but differ in shape. Huaraches originated in Mexico City in about the early 1930s. Their origin was at a stall along La Viga navigation channel, where Mrs. Carmen Gomez Medina prepared tlacoyos. When the navigation channel was covered to make the "Calzada de la Viga", Mrs. Gomez moved to another place and after 1957, when the Mercado de Jamaica was founded, she moved there, and then to a little place at Torno street. Because the shape of the new "invention" of Mrs. Gomez different from that of a sope or a tlacoyo, people started to call it "huarache". ↑ "Instituto Linguistico de Verano"
↑ Robb Walsh "Historic Huaraches in Stafford"Houston Press. July 01, 2008. 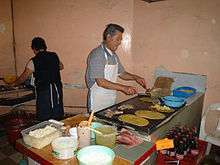 Wikimedia Commons has media related to Huaraches (food).